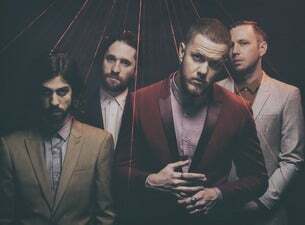 Hailing from Las Vegas, the four piece consists of frontman Dan Reynolds and band mates guitarist Wayne Sermon, bassist Ben McKee, and drummer Daniel Platzman. The band have had an astonishing rise to prominence in the last 12 months. One of America's hottest new bands, they are breathing fire into the rock 'n' roll scene. In the US their much anticipated debut album, Night Visions, entered the charts at number 2 and had the best first-week sales of any LP released by a rock band in over six years. With sales in the US in excess of 83k and over 30 million views collectively on their YouTube videos. The debut album Night Visions was released on Grammy award winning producer Alex Da Kid's (Eminem, Rihanna) label, KIDinaKORNER. "This record has been three years in the making," Reynolds explains of his excitement in finally getting to share the album with the world. "We feel that we have finally created something we are all truly proud of and that can hopefully inspire others and help them feel a little less alone. That's what music is about. It's the greatest communicator I know." The album features breakthrough hit single ‘It’s Time’ (which has sold a staggering 1,500,000 copies in the U.S.), along with the big statement "Radioactive," which blends a throbbing backbeat with delicate acoustic guitars and deals lyrically with facing the apocalypse. "We want people to hear that song and feel empowered," Reynolds explains. Meanwhile, the delicacy of tracks like "Demons" balances the album's expansiveness with a sense of human intimacy. IMAGINE DRAGONS album went straight into the Top Ten in the Irish Charts and Number 2 in the UK charts when it was released in March. The band have just finished a massive European tour, which saw them play an stunning set at the Trinity Ball. The band have had such an astonishing breakthrough in the past year, and are now on the brink of becoming one of the biggest bands in the world. 2013 is set to be the year when Imagine Dragons become the global phenomenon their US story suggests.